Abeno Harukas Announces 3rd Anniversary Event Vol.8 "PLAY! TETRIS® TOWER"
Play Japan's first live "Tetris" game projected on Abeno Harukas skyscraper! OSAKA, Japan - Nov. 17, 2017 - In celebration of its 3rd anniversary, Abeno Harukas, the tallest skyscraper in Japan, standing 300 meters high, has been hosting events throughout the year to mark the occasion. The next event, vol. 8, is "PLAY! TETRIS TOWER," where the game of Tetris, one of the most popular video games of all time, will be projected on the outside wall of the twin towers for visitors to play and experience live, surrounded by the city's beautiful night skyline. This will be the first Tetris event of its kind for Japan. The "PLAY! TETRIS TOWER" event will run from Friday, December 1, 2017 to Wednesday, February 28, 2018. The game will be projected on the outside wall of the twin tower's west side from the 58th floor Skylark Garden on the observation hall Harukas 300. Tetris was developed in 1984 and celebrates its 33rd anniversary this year. For 'Abeno Harukas' 3rd anniversary, we will hold this event. 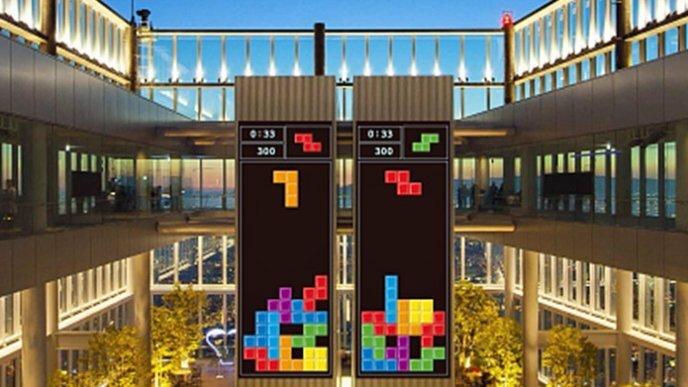 It is the first event in Japan to play Tetris® on a huge wall, although it's usually played on video game consoles or mobile devices, moreover surrounded by a beautiful night view seen from the tallest building in Japan "Abe Harukas". We hope you enjoy a unique experience with great excitement. Abeno Harukas anniversary events also includes "SAKURA POOL," which has already finished, and the previously announced "Illuminations of the Avenues Harukas Tenkai 2017" and "CITY LIGHT FANTASIA by NAKED NEW WORLD," which are also running during the "PLAY! TETRIS TOWER" event. Visitors are welcome to come and visit Abeno Harukas" to enjoy these amazing, fun events this winter. 2. Contents: Tetris will be projected on the outside wall of the twin towers for visitors to play and experience live, surrounded by the city’s beautiful night skyline. This will be the first Tetris event of its kind for Japan. It may be canceled due to rainy weather, stormy weather and other circumstances. The reception may be closed before 21:30. There are only 3 control stations on the 60th floor. You can also see the projection from the 58th floor. 6. Number of Players: Up to 2 players per playing place per control station. Everyone is invited to play. There are limits to the total number of people who can experience the game each day.